Mossy Bank is a - largely natural - Village owned park here in Bath, NY. The earliest report I have received of flying taking place from Mossy Bank is from Bob Grant. He described flying a UP Comet OVR (Owens Valley Racer) from Mossy Bank Park in 1980. I believe earlier flights are also likely to have occurred, but no confirmed reports as of yet. 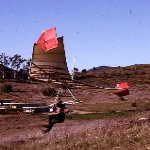 So, there is at least a 35 year tradition and culture of hang gliding taking place from the park. With this thread I'd like to document that tradition and culture. I'll begin with a few pictures as soon as I can find them in my large collection of old slides and modern digital image files. Anyone else who has flown from Mossy Bank, here in Bath, NY is welcome to post their own pictures in this thread. A caption that includes the date the picture was taken, and who's who in the picture would also be great. Bob Grant's wife Maureen took this cool picture of me on final approach above the field below Mossy Bank Park (abt 2007-2008?). Glider is a WW Fusion SP. The shadow is a 1975 Standard Rogallo! Here's another (composite) shot which I created by combining two different quick succession photos taken (again) by Maureen Grant. Sadly, I don't remember his name, but here's a nice pilot portrait I took at launch up at Mossy Bank Park back in July of '07. Nice thermal generators out there in the valley! Here a glimpse of the NW corner of the top landing LZ near Mossy Bank Park. I'd advise an Advanced rating - or close to it, due to a couple interesting obstacles. Otherwise it's about a 20 acre field. What are you flying over in that picture? It doesn't look like anything I've ever seen before ... at least not from the air. Your Mossy Bank site looks really awesome!!! You should host a fly-in when the weather warms up!!! All of the pictures are super. Kudos to Maureen!! Recently the farmer, who leases the fields, has planted field corn for the last 3-4 years. Once that crop gets much over 1-2 feet tall, landings start becoming tricky and some stalks might get knocked over. Once between 3-8 feet, a safe landing is not possible. Effectively the farmer has killed Mossy Bank as an active (good on North days) flying site. You will notice two trees on the south side of the Cohocton River basically opposite the browner mowed LZ circle. Well, with permission of the land owner, those trees are now firewood. And for perspective, the mowed circle is ~100' wide, flat and level. *Note: I'm not so sure a collapsible canopy occupant could have their canopy fall back, after landing, and not do some damage to those kinds of smaller crops. Gathering up the canopy is where the harm may be done. I used to fly a hill where I had to approach a small clear landing area by approaching very low over a mature grape vineyard. Not much fun to be thinking of that coming landing while flying. 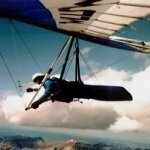 fcolver wrote: I used to fly a hill where I had to approach a small clear landing area by approaching very low over a mature grape vineyard. Not much fun to be thinking of that coming landing while flying. For those of you interested, here's a picture looking from the "new" LZ below Mossy Bank, back across the river toward the south. Those two trees opposite the "new" LZ (in the last picture of the LZ from above) are the stumps that you see in this photo, taken today. A pilot on final approach would be headed for my position not far from the bulls-eye. Concerning the wind flags in the picture, one is stuck in one of the stumps on the south shore and the other (lower, bigger looking one) is up the bank on the north shore. When fully grown, the corn would be about 3/4ths as high as the far wind flag. FYI - A view of the river is blocked by my perspective, but it sits between the two wind flags.